Just a quick note about a new site / product a few of us have been trying out for the last few days called Yammer. What it boils down to is a microblogging platform that is a more robust, secure, and souped-up version of Twitter for the enterprise. It's restricted to your domain (initially, this is based on the email address you sign up with) for the Basic account type (this is what we currently have setup, completely free to try out), so if you're on the same domain as your colleagues, you should be able to join your shared company account easily after registering. And that's just the free stuff. I'm not even sure what the paid accounts offer just yet. Yammer's membership plans are quite reasonably priced ($1/$5 per user, per month, depending on the plan), with a bunch of additional enterprise-friendly features. In a technologically-oriented organization like ours, I can see some definite value if we can properly complement our existing tools without replacing features we're already using. Yammer definitely has a leg up over using a public application like Twitter as it really suits the needs of an single organization much better, providing support for common internal activity streams, easy remote access on a variety of mobile devices, and a relatively low price-point. To be fair, I'm not the final decision-maker in this case, I'm just providing suggestions for improved tool use within our organization. 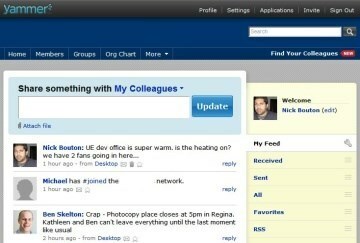 Yammer makes a good argument for itself and requires very little explanation or support. It remains to be seen whether it provides value or increases productivity here, but I'm impressed with the functionality I've seen so far so I'm more than willing to give it a chance. If you have experience using Yammer or other similar microblogging applications within the enterprise, we'd love to hear from you.